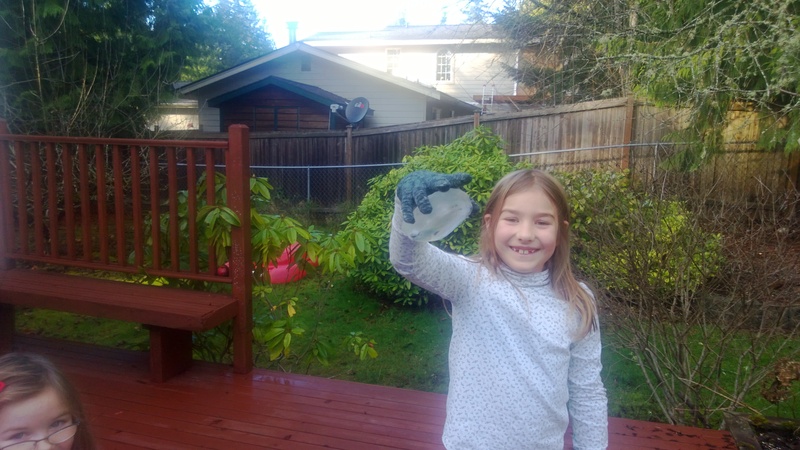 My children are fascinated by ice. 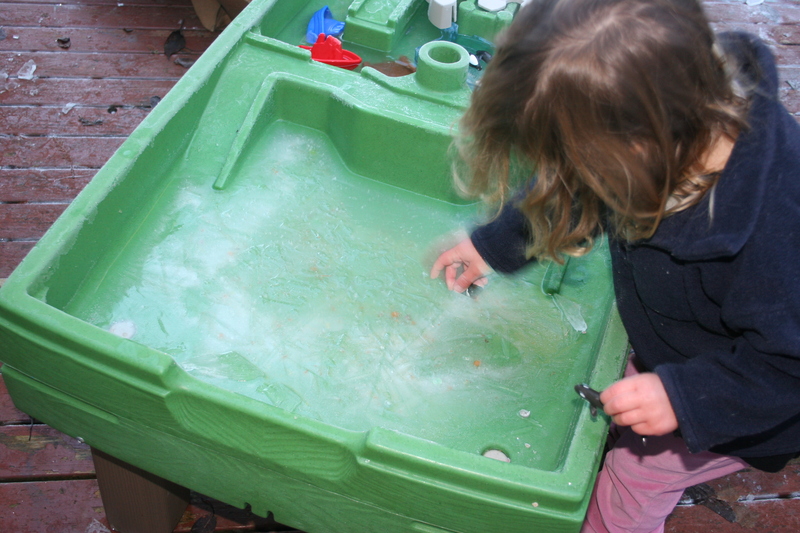 I’ve added loose parts to ice before, but never considered that ice could in itself be a loose part. 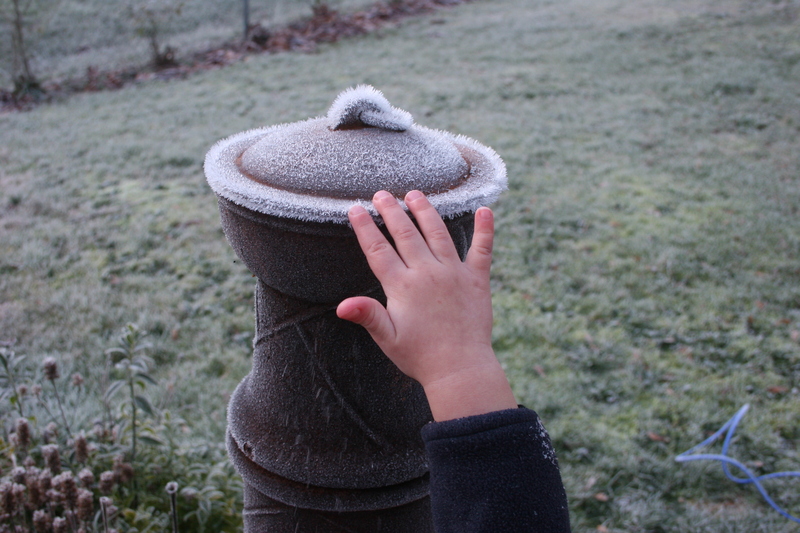 When the cold weather comes, the first thing my kids do is to check if their water table has frozen and any other containers they have left around the garden. the cauldron has loads of ice in, not like yesterday. How can we break it? The next thing they like to do is to go to the storm pond near their friends house to see if it has frozen. Last year it froze solid for the first time. The kids loved throwing sticks to try to break it and even ice skated on it. When the ice wasn’t solid enough to walk on, it was just as fascinating. The children broke off the surface, ice sheets very carefully and had competitions to see who could break the largest piece. 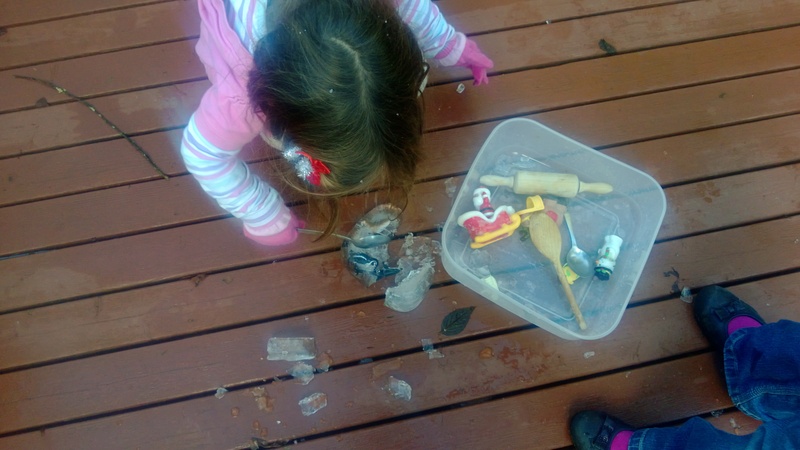 My youngest insisted on carrying pieces home, even though her fingers were numb and left them on the doorstep to see how long they would remain frozen. When the pieces broke, they used them to make these pictures. Presents challenges as it changes form. I broke this piece – look at all the lovely patterns. 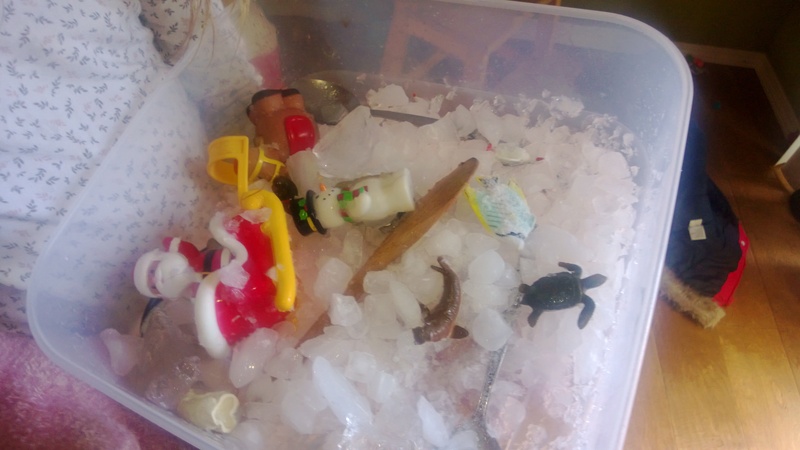 If you don’t live in a cold climate you could make your own in moulds in the freezer or place a few bags of ice outside and see how the children explore. This piece looks like a magnifier. I can look through it – see. 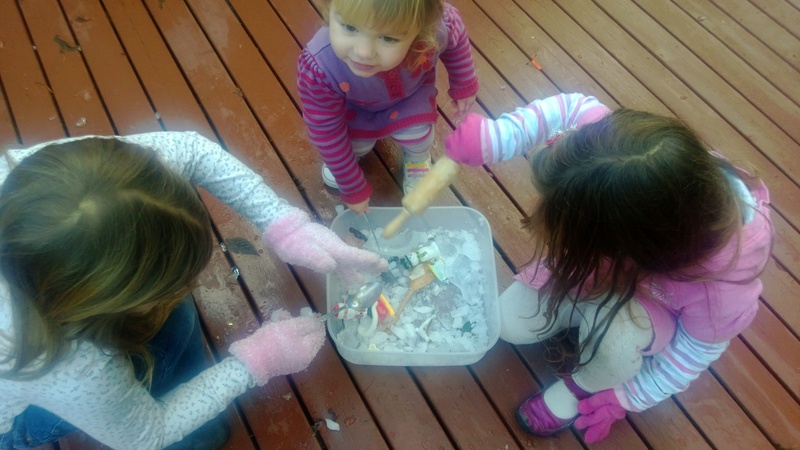 Outdoor Play: Ice Activities – how a simple art ice project turned into a science investigation. 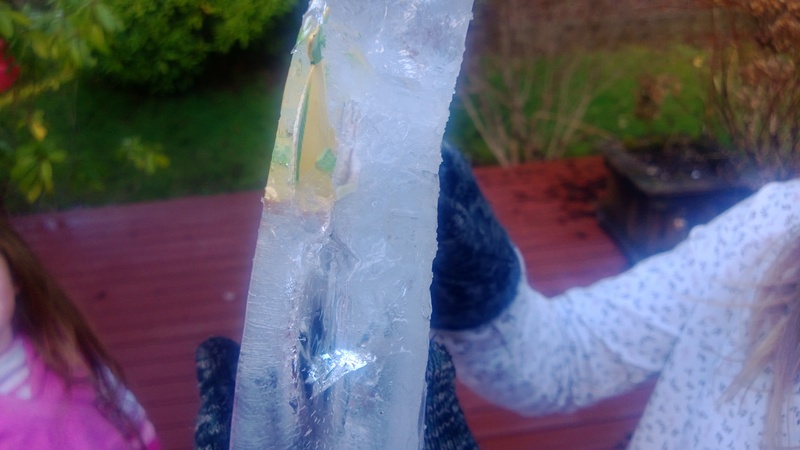 What had originally been an icy art project, unexpectedly turned into a fascinating science investigation. A few weeks ago we filled up my baking tins with water that we coloured with powder paint and dropped all manner of things into them. 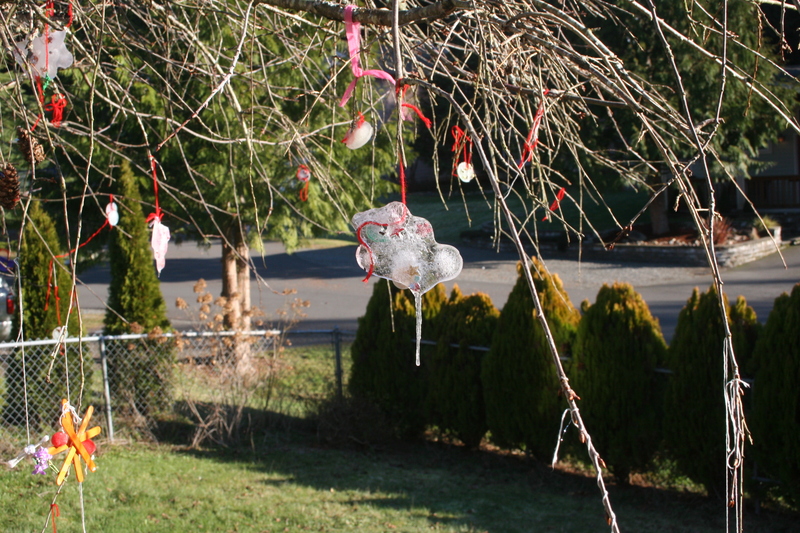 Shells, berries, leaves, sequins, buttons and even a stone were placed inside to make ornaments for our tree. The weather unfortunately instantly became warmer, so we had to wait some time before they were ready to hang. 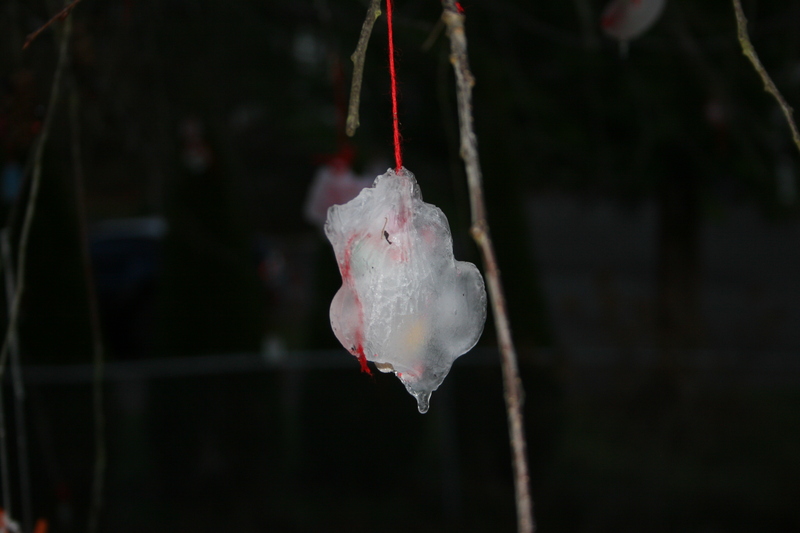 Even then, only the top layer of ice had frozen and within an hour of hanging them on the tree they had melted. We also discovered that if you colour water with powder paint it separates once it begins to freeze, so most of the ornaments were not the lovely colour we had hoped for. 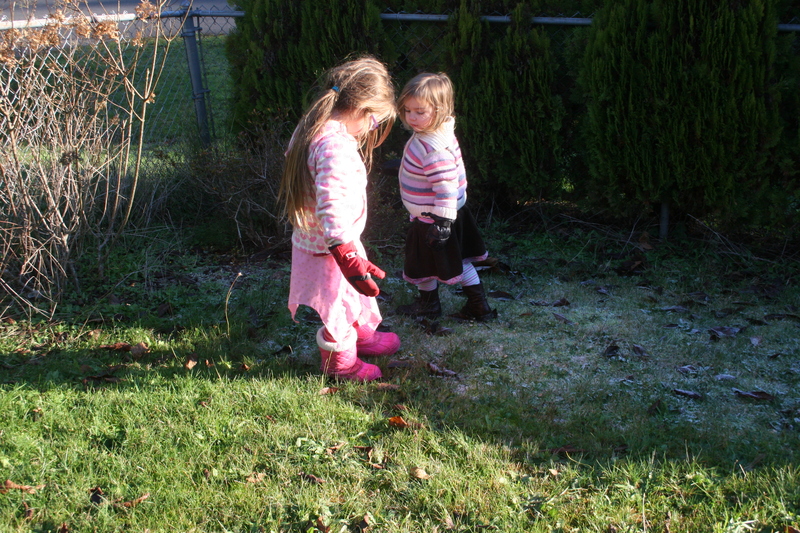 The girls have been peeking outside every morning to check if there is any ice. This week they were rewarded with below freezing temperatures. 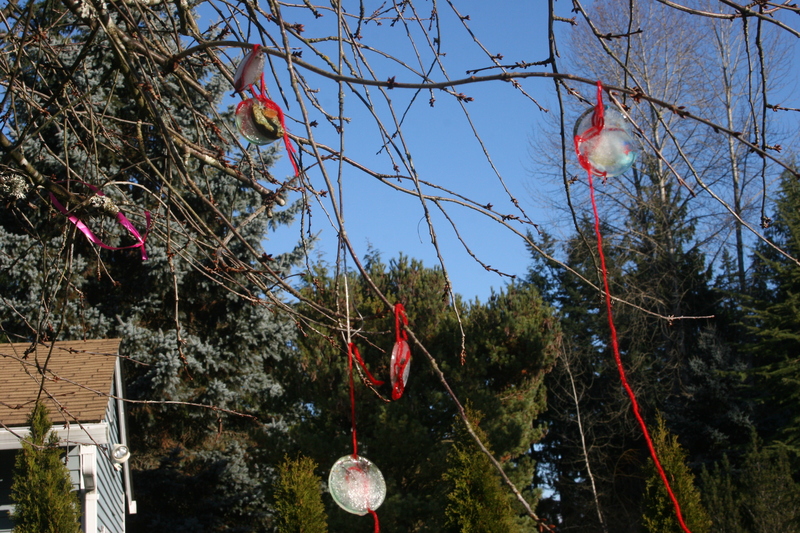 The ice ornaments were finally ready! 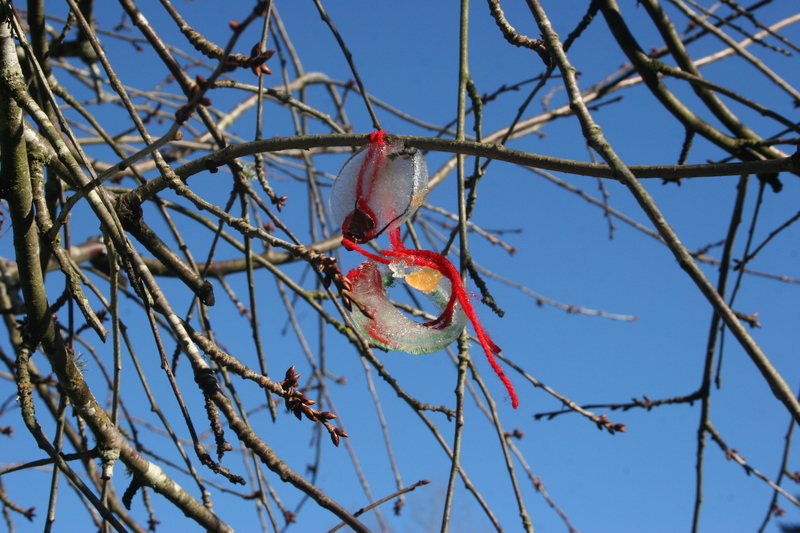 We hung them on the tree. The sun was shining and the tree stands in the sun until mid afternoon. I wasn’t sure how long they would stay this time as ‘plop’ one fell down from the tree. Let’s put it by the door. That’s in the shade – it might make a nice present for Father Christmas. As we went inside I asked the girls to watch the ornaments from the window. They’re wet and they’re dripping down. What do you think will happen as they melt? I don’t think it will fall off the string because the string is attached. It will just melt and the floor will be wet. Look this one has holes in it. It might break not melt. Within an hour or so the tree was in the shade and the temperature was beginning to drop. We noticed that the drips were starting to turn into little icicles. The girls thought this was really cool and the next day even more so when we saw large icicles had formed. They rushed outside to feel them, touching them gently so that they didn’t break off. The weather was so cold that during the late afternoon I sneaked into the garden with a jug of water and some pirate coins. I put the coins in various containers and poured a little water on the top. In the morning I invited the girls on a pirate treasure hunt. First they needed to make a map. I had some coffee stained and singed paper that in true Blue Peter fashion I had prepared earlier. Out they went and quickly found coins. The hammers were their first choice. They weren’t very successful so then they tried the salt. They found that if they used the spoons and the salt they could gradually get down to the coin and hook it out. This could take ages, if we got a jug of hot water it might be quicker. The ice is still there you just can’t see it. We were talking about the sea salt later in the day. How do the pirates get salt from the sea? Good question. The salt is in the water so how do you think they could get it out? What do we need to do to make the salt disappear into the water? How? Do you remember how we made jelly dissolve or the sugar water we make for the hummingbirds? We put hot water on it. Let’s be scientists and do an experiment. The girls helped to stir the mixture until all the salt had dissolved. 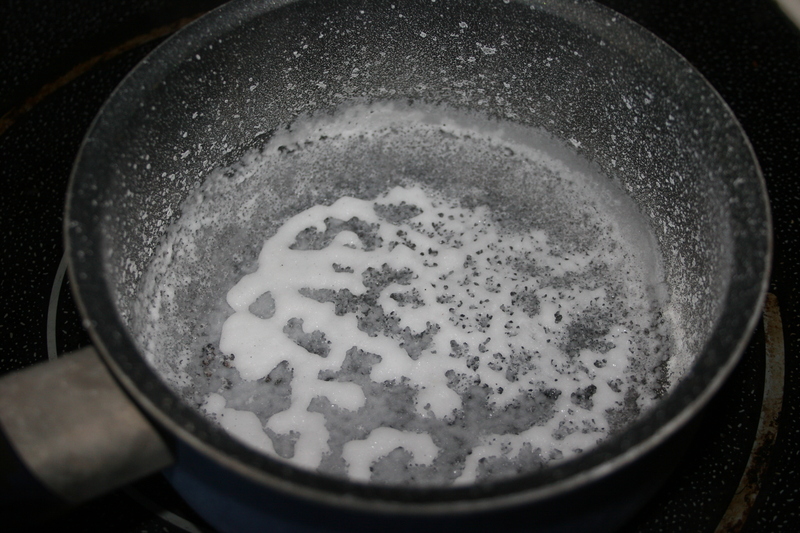 We poured the mixture into a pan and put it on the stove. 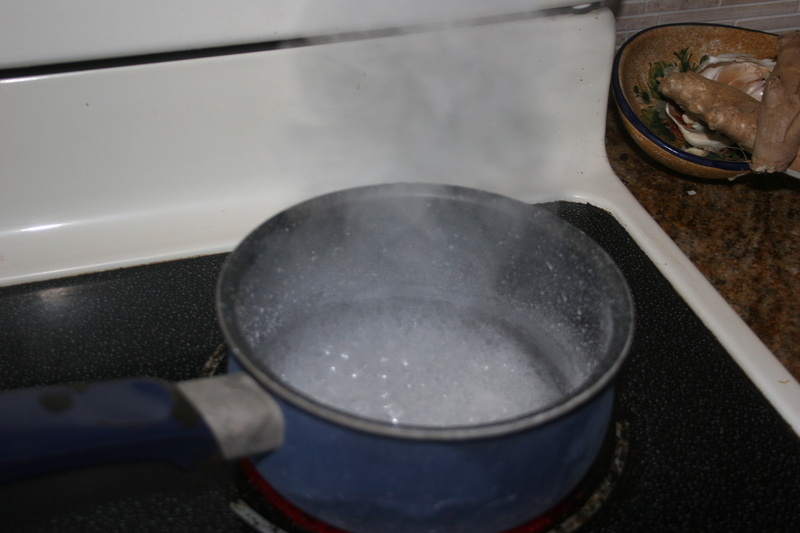 What happens to water when it gets cold? What about when it gets hot? Watch. What can you see. If I put this spoon over the steam what can you see on the spoon. Yes the water is turning to steam. Now look what’s happening in the pan. What do you think the white stuff is? I don’t know. Is it steam. No. The water has gone now so what is left? We had another idea for an experiment. If we put the salt back in water and then left it outside would it freeze? We will find out tomorrow. How did you get them in there? We need something to bash them out – let’s try a spoon. Look, I broke a piece. The fish is coming out. I made a hole – grab the fish. Help it’s sticking to my hand, what do I do now. Can you pull it off? Look, I broke it in half – I can see a penguin. Ice mummy! I love ice. Bash, bash , bash. We’ve found all the animals, can we have more ice? We added crushed ice from the ice machine on the fridge. This is a great activity for water trays in pre-school settings but works even better outside, if you are in a cold climate set up a water tray outside and let nature do its work. 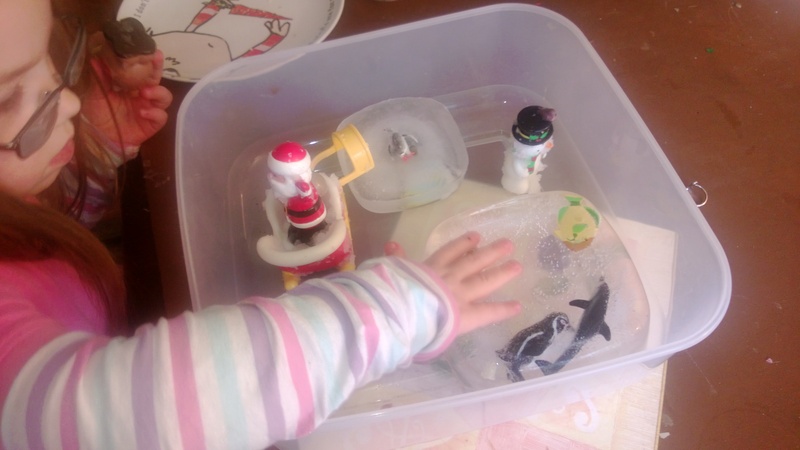 Add colour to the ice using food colouring or bath colours. 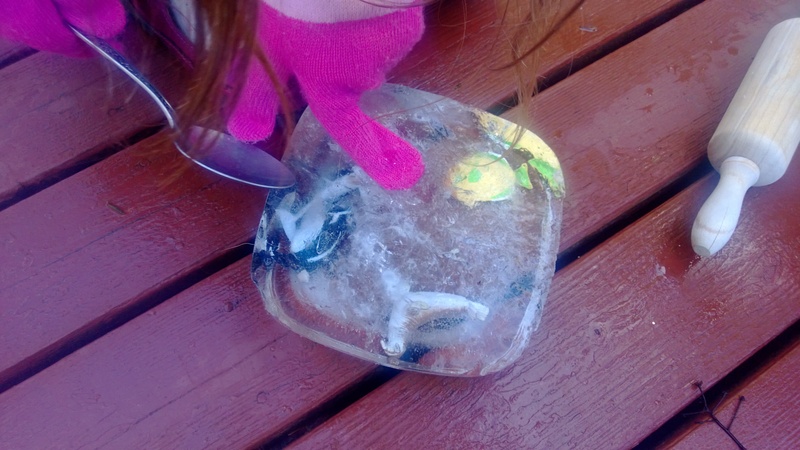 Using a dark colour so the children have to guess what is hidden in the ice. Put a small amount of warm water into the tray. Add the coloured ice. What happens to the water? What happens to the ice. 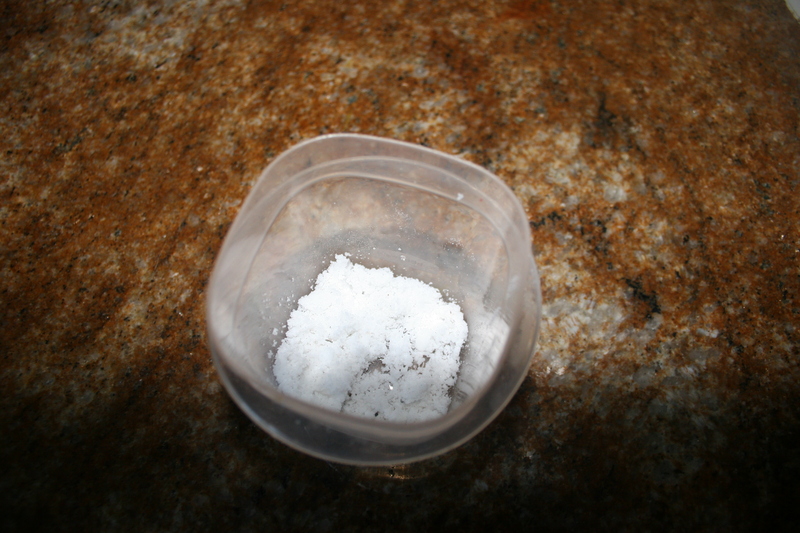 Sprinkle glitter into water – leave it in the freezer or outside overnight. What happens when it melts? You are not allowed to bash the ice, how else could you get the animals out? Can you find any more ice in the garden? What would happen if we froze a leaf or berries? If we hang them from a tree how long will they take to melt? What happens when they are melting? 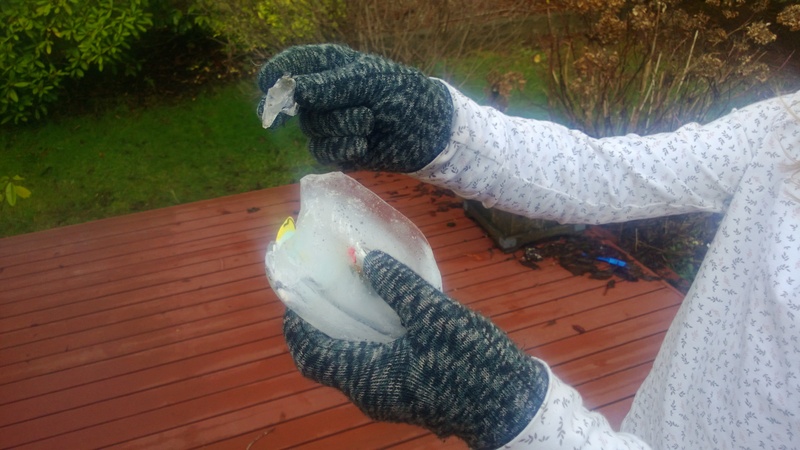 The ice sticks to your gloves, what else will it stick to? Why does it only stick to some things?